In keeping with the credit union philosophy of “People Helping People” the New Dimensions Federal Credit Union staff, Board of Directors, and volunteers are all active participants in fundraisers designed to benefit the people of Maine, particularly in our communities. The majority of these fundraising efforts directly benefit three organizations: The Maine Children’s Cancer Program (MCCP), Maine Special Olympics, and the Ending Hunger in Maine Campaign. Take a look at what we did to make an impact in 2018. An excerpt from our 2018 Annual Report. Throughout the year, the credit union hosts various fundraising events at the Waterville, Winslow, Skowhegan, and Augusta locations. During the winter months, the public can purchase homemade soups on our special “Soup Days”, or stop by any of the participating branches for the ever-popular annual Harvest Fest, which is typically held in the fall. 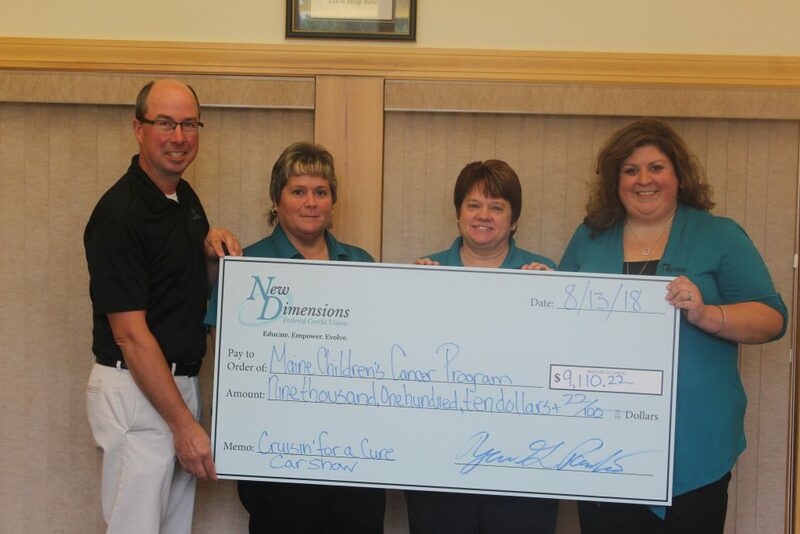 Our most recent summertime event, which began in 2014, is the Cruisin’ for a Cure Car Show, benefiting the Maine Children’s Cancer Program in Scarborough. Car enthusiasts from all over the state assemble in Waterville, to share their love of cars and help raise money for the MCCP! The New Dimensions Federal Credit Union fundraising achievements are a direct reflection of the generosity of our members. If you have any fundraising ideas or would like to make a donation to any of the three worthy organizations listed above contact the credit union at 800-326-6190. Should you have a donation request of your own, please print the Donation Request Form and email it to info@newdimensionsfcu.com, or mail the form to 61 Grove Street, Waterville, ME 04901 ATTN: Marketing.